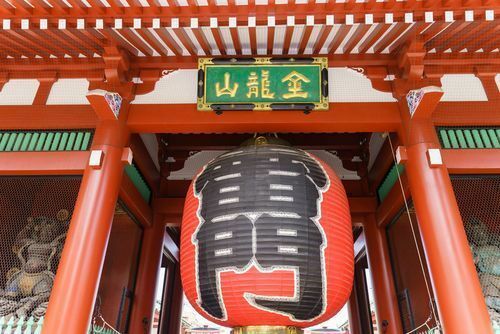 Asakusa is one of the most popular sightseeing spots where visitors can experience Japan in a traditional way. 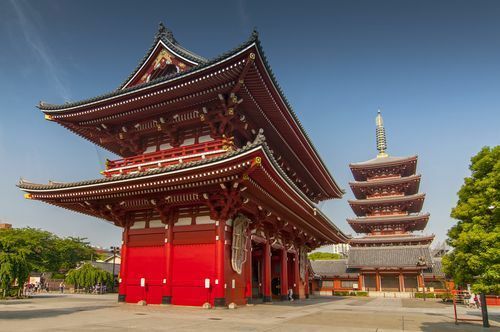 The top three places to see in Asakusa are the beautiful and old temple, Sensoji; the unique and huge gate, Kaminarimon; and the traditional and exciting shopping street, Nakamise Dori. All are very close to Asakusa Station. When you go to Nakamise Shopping street, don't miss the tasty street food as they have a lot of Japanese snacks that you can eat only there! Passing through the majestic and symbolic gate called Kaminarimon (雷門), you will find much fun and excitement. There is a shopping street, Nakamise Dori (仲見世通り) that is approximately 250m long approaching one of the oldest and most famous temple, Sensoji (浅草寺). There are numerous store on the street, selling various Japanese-style products, such as hair accessories, dolls, art products, postcards, and snacks to eat! Here is a guide to Nakamise's street food you need to try! Kibi Dango is a type of traditional Japanese dumpling made from millet and mochi rice flour. It is coated with soybean powder (called kinako/きな粉). It is a very simple, yet you can enjoy the natural sweetness and the soft and chewy texture of the dessert. 5 small sticks of dango are ¥330. Please be sure to enjoy this delicious yet typically Japanese dessert in Tokyo! This dessert is delicious with a nice cold matcha tea. A significant snack in Asakusa. Kaminari came from the name of the gate "Kaminarimon", and Okoshi means to prosper, so this snack is said to bring good luck. They are crunchy and sweet puff rice crackers. They have different flavours like black sugar, matcha, and sesame. Good for souvenirs as well for your family back home when you visit Tokyo. "Age" means deep fried and "manju" is a typical Japanese snack that is a soft mochi stuffed with "anko" (sweet red bean paste). Freshly fried at the shop, they are hot and crispy on the outside. They offer a variety of unique flavors such as sesame, matcha, pumpkin, cherry blossom, and many other seasonal flavours. They are ¥120-200 each at this Tokyo shop. These fried red bean small cakes are deliciously addictive and filling. Ningyo Yaki (doll cake) is a fluffy sponge cake filled with sweet red bean paste. These sweets are freshly baked by the chefs using a traditional machine, they can come in various shapes like birds and animals. They are small but very detailed. You can either eat there or bring them back. A box of 8 is ¥600. When you get them hot, the staff will put them in a small baggy for you. They go so perfectly well with coffee as these little cakes are quite similar to the popular French sweets Madeleines. And the sweet smell of these warm cakes will make it very difficult to eat just one, but you've been warned. Sweet potato jelly (imo yokan/芋ようかん) is a Japanese traditional snack which originated in Asakusa. It is very smooth and creamy, and you can taste the natural sweetness of the sweet potato. They sell many kinds of souvenirs that are beautifully wrapped. They also have a cafe where you can enjoy the jelly and other desserts, such as ice cream and "dango" with matcha green tea. The dessert has a nice soft texture and it isn't overwhelmingly sweet. It's perfect for when you want something to pick you up when you're feeling a little tired from walking around, but you're not ready to have lunch or dinner yet. It goes very well with coffee. Eating is one of the most important parts of any trip, right? Especially if you are visiting Japan, the country with the most Michelin stars, where Tokyo, Kyoto & Osaka are the 3 most decorated cities! It's insane to think of the food culture in this insular country. From the street food to the high-end restos, they all have their charm. For some awesome street food vendors, you should visit Nakamise shopping street to enjoy the traditional atmosphere and snacks! You'll definitely be back again, both for more snack for yourself and for souvenirs for your family! No wonder Asakusa is such a popular area for visitors coming through Tokyo.